Easter is just around the corner. As I was wondering what Easter-related project I would do this year, I came across the picture of this bunny I made last year, based on a pattern I purchased at the Handmaiden in Sandy, Utah, across the street from Quilts, Etc. My mother loved it, so it now lives in Brazil with her. 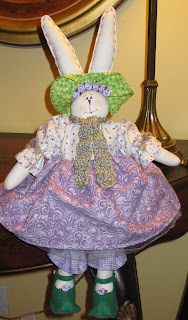 I am tempted to make more bunnies for this Easter - perhaps a decoration for the front door or a banner. Whatever I decide to do, I will share a picture with you. What are you working on for this Easter?